Instore customers can integrate one or more Dejavoo card terminals to accept EMV (chip) cards as well as NFC (e.g. Apple Pay) payments. These terminals can be used instead of or alongside a Magtek Dynamo card reader. Please speak to your Instore representative about purchasing a Dejavoo terminal. As with most hardware peripherals, we strongly recommend Ethernet connections where at all possible, so the Z6 or Z9 will be more reliable than the WiFi-based Z1 and Z8 terminals. Turn on the Dejavoo terminal and ensure that it is connected to your store’s network. If you need help connecting the device, refer to this help article or the device user manual. On your iPad, open Instore, touch the Settings gear, then touch Payment Terminals. Touch the + add button where you will input your Dejavoo terminal’s IP address into the IP Address field. To find this address, click the WiFi icon on touchscreen terminals or F1 on other terminals, then Comm. Status. Enter the IP address into Instore exactly as it appears on the Dejavoo terminal (example: 192.168.1.239). Once the IP is entered, click Add Terminal on Instore. If properly connected, your Dejavoo terminal will display as Online. Note that if your Dejavoo terminal shows as Offline on Instore, you can Delete the terminal on Instore and reconnect it. Right-to-left swipe on the Payment Terminals screen and touch Delete. Refer to steps 1-4 above to connect again. If you are having trouble connecting, call our support line (855-568-3696) or your processor to ensure it is configured properly. After completing an order on Instore, touch Pay, then touch the Dejavoo Terminal button. Complete your normal credit card flow on Instore, including signature for payments greater than $25 and tip adjust if your store accepts tips. 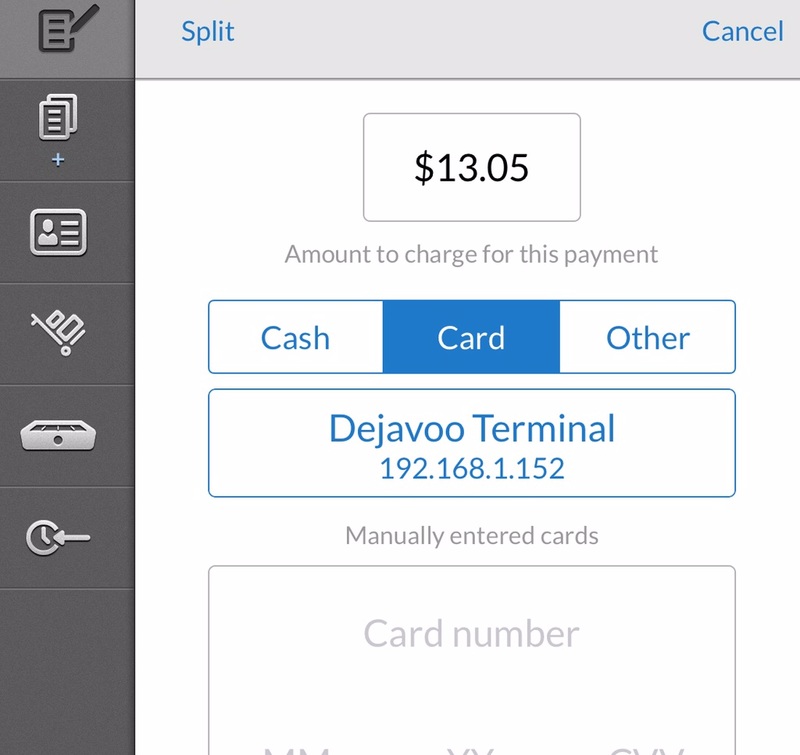 Instore sends the payment information over the network to the Dejavoo terminal. Your confirmation that the information has been sent is a blue screen with “Waiting on terminal”. Follow the prompts on the Dejavoo terminal to accept payment with either a chip card or mobile payment solution such as Apple Pay. The Dejavoo terminal will notify you when the payment has been completed and send a signal to Instore that the transaction has been Approved. Instore will also be notified if the payment is declined. Note that Instore waits for up to 3 minutes on the Dejavoo terminal to send a transaction complete notification. If you need to abort the transaction, do so by using the red button on the Dejavoo device. Closing Instore to reset the application runs the risk of a transaction status disconnect between your two devices. On Instore, find the transaction on the Paid Orders tab. Right-to-left swipe on the Paid Orders list or open the Order and touch Refund. Tap to choose how you’d like to complete the refund. Select Begin terminal refund (card required), then select the Dejavoo terminal you are using from the list (you will most likely have only one listed). Instore sends the refund request over the network to the Dejavoo terminal. Your confirmation that the information has been sent is a blue screen with “Waiting on terminal”. Follow the prompts on the Dejavoo terminal to generate a refund with either a chip card or mobile payment solution such as Apple Pay. The Dejavoo terminal will notify you when the refund has been completed and send a signal to Instore that the refund has been Approved. Instore will also be notified if the payment is declined. When finished, touch Complete Refund on Instore to move on to other things. Most Instore users accept tips directly on the iPad screen. If you instead select No Tip on Instore and send the transaction to the Dejavoo terminal, the terminal will prompt for a tip before accepting payment. If you allow the customer to enter a tip on the terminal, it will be included with the transaction approval sent by Dejavoo to Instore. No tip adjust required. If you skip the tip prompt on the Dejavoo terminal but want to tip adjust later, you’ll need to submit the tip under your Instore Paid Orders AND the Dejavoo terminal. Instore will remind you to adjust the transaction on the terminal. To complete the adjustment on the Dejavoo terminal, navigate to Tips and Tabs/Edit Tip/Untipped, find the transaction, and make the adjustment. Note that the Dejavoo terminal allows you to save common transactions like Tip Adjust to the Favorites menu. NOTE: merchants that don’t accept tips at all can turn this functionality off on both Instore and the Dejavoo terminal.